Even though there is a art-school trained photographer in the house, there are few portraits of the photographer’s wife (that would be me). Having said this, I am evaluating my motives in discussing this topic. Am I simply a conceited, starved for attention type, just a few photos short of being world-famous? The first time my husband (then my boyfriend) took photos, we were in the living room of my tiny condo and he was experimenting with a lighting effect. Honestly, I’m not sure what he was trying to achieve. He’d rented some lighting equipment and was likely prepping for a job. I was a handy subject. The sensation of having a lens focused on me — and not for a snapshot — was an almost unnerving experience. I’d been a shy girl all my life, preferring the quiet loneliness of a hillside or a library carrel to any other atmosphere. I hadn’t lived on campus during my college years, and never had more than a handful of friends. (One of my best friends from my work years told me that she really didn’t know much about me until we started socializing about 10 years after we first started working together.) All of this helps explain how I ended up with the shy, quiet photographer in my living room one afternoon about 16 years ago. This polaroid is the only surviving photo from that session, and I scanned it a few years ago in an attempt to preserve what was left of it. 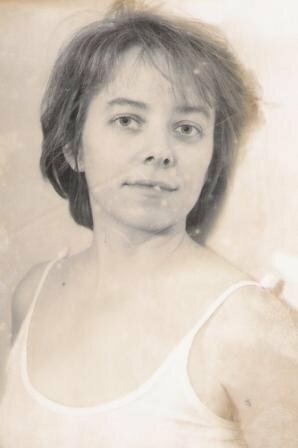 The grooves and watermarks give it a true patina, and as I look at the subject, I wonder, who was that woman? My husband’s photography business went the way of many independent commercial photography businesses over the past decade. Digital photography, iStock, non-existent marketing budgets, and a few recessions (one mega one) have ended many commercial photography careers. Photo studios in town that used to employ many and provide a decent living have consolidated elsewhere (Daytons/Target, etc). My husband found a good job as a media technician in a local elementary school, and now photographs children (one of his strengths) and teaches students and teachers how to compose and shoot digital photos and movies. He’s taken two more portraits of me over the years. 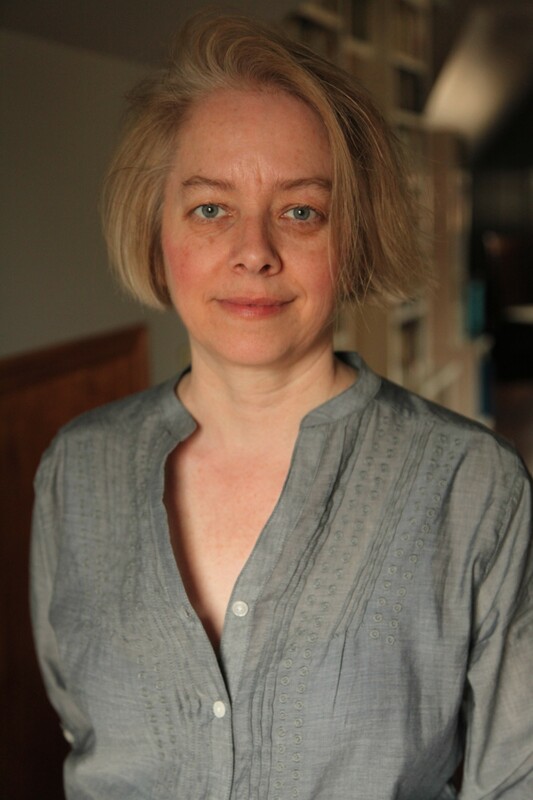 The first is my present author photo (on my welcome page) and the second is this current work-in-progress (a little fine-tuning in Photoshop to adjust light levels is yet to come). I look at the face in the photo (mine, I think, in delayed reaction) to see that not much has changed (a good thing), but still wonder — who is that woman. My strange habit of thinking of myself in the third person is no help really, it’s a way of ‘fictionalizing’ that woman ===>, maybe romanticizing her (me), to give her the LIFE, versus my ordinary life. I wonder: if a professional portrait does nothing to give you clues about yourself, are snapshots any better? Still, even in a snapshot we ‘pose’. What does a photograph tell, if anything? At the right, for instance, we see a healthy middle-aged woman, lit by natural light. She’s smiling slightly, and the subject herself knows how hard it is to smile on cue, but the photographer said something funny. Behind her we see bookcases lit by sunlight coming through another window. She is standing in her own house. You, the viewer, are making your own assumptions based on your own experience. Can we really tell anything from a photo? You don’t know about the 40 other shots Kurt took, that we both rejected in selecting this one. Perhaps this last photo, to the left, is more ‘telling’ than the others posted on this page. Taken a few years ago, the photo subject took on snow-removal duties while the photographer was experiencing one of his frequent, painful bouts of sciatica. He hobbled out to the curb to snap the photo. (On my insistence, I should note). By looking at the photo, it’s hard to tell if it’s a man or woman all suited up. A Christmas wreath hangs above the door. 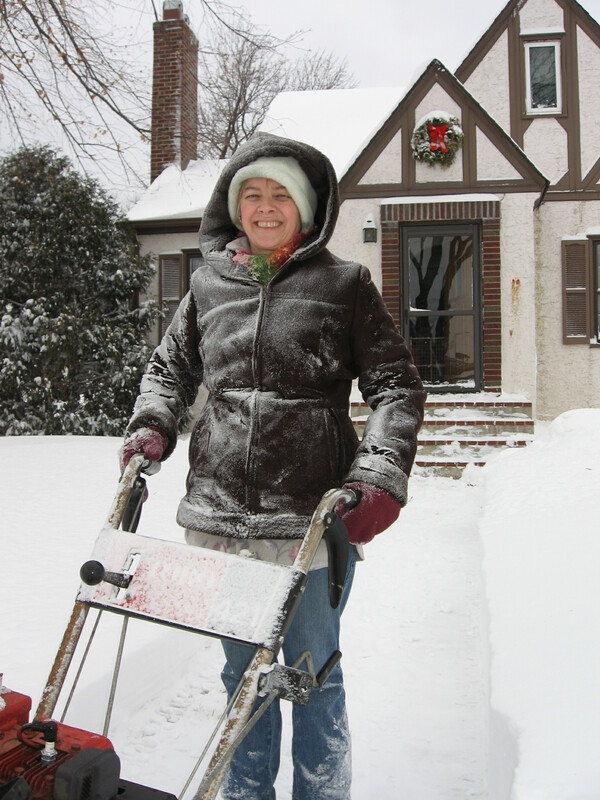 Why of course, it’s the not yet world-famous mystery author, plodding behind a snow-blower. At the time, I felt proud to be able to handle a snowblower, thank you very much, and that’s what the big smile communicates. In fact, I kind of prefer the outdoor stuff, and if I wasn’t so puny, I’d take on more. I like the fresh air. Still, who is that woman under all that snow? Why did she coerce her husband to hobble on out to the street for a photo shoot. She can be kind of annoying that way. 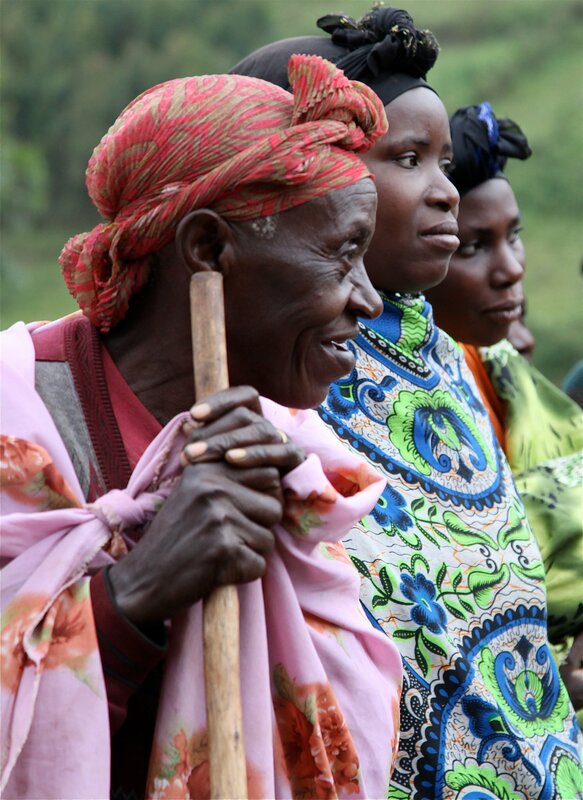 To close I offer a portrait of three women, taken by my husband on his recent trip to Uganda. Contrast your response on viewing this portrait to what you thought looking at the photos Kurt took of me. How does your response differ? What do you know about these women by viewing this photo? Their colorful dress, the expressions on their faces? They were photographed perhaps unaware of the photographer, but probably not. My husband was traveling with a group of westerners and they would obviously have stood out. My husband’s camera would not have been unnoticed. The ‘story’ that I know of the photo is that the women were walking by and stopped to watch a performance by other local people. What is this photo telling you that the others posted here are not? Are these women posing for the photo? What are they trying to tell us? ← Do You ‘Get’ Poetry?